The very skilled and intrepid crew have confirmed the extra 3 days of their adventure, which will now last until Tuesday 1st July. Alan has devised a cunning route to test the crew to their very limits. The route will be some 173.5 miles long, including 192 locks and their chances of success is far from certain. 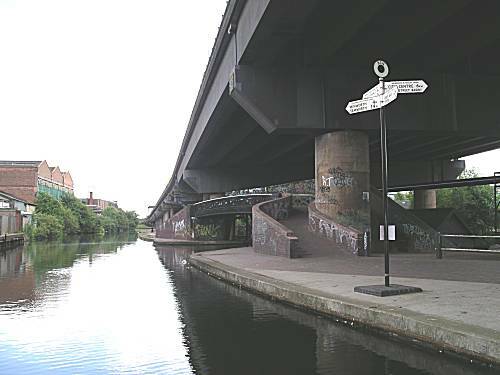 The never attempted before route is to be known as "The Giant East Midlands Ring". Click here to see the master plan of their route. The crew gathered at Alan's house at the start of their epic journey at 9-30am. 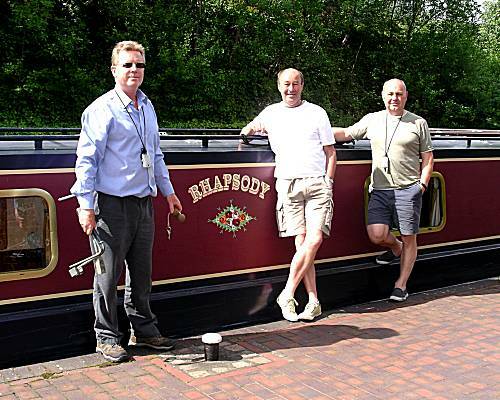 The uneventful journey took the crew rapidly to The Kings Bromley Marina, where the narrowboat Rhapsody was eventually located. As it was apparent that preparations for our arrival were at an early stage, the crew took the opportunity to travel to Lichfield to visit the local Morrisons establishment where full use was made of their restaurant facilities. Morrison's big breakfasts were enjoyed by two of the crew, whilst Neil chose Fish and Chips, but had to endure a long wait. Afterwards sufficient healthy provisions, including Smoked Mackerel Fillets were procured for the start of the trip. After a short wait the crew were shown around the boat by the owners and found it to be to their liking. A number of feminine enhancements including amble cushions and throws were observed which seemed foreign to the crew. 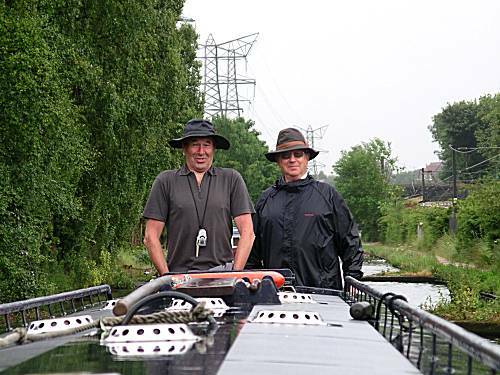 Ron took control of the boat and bravely took it onwards down a number of locks past Fradley Junction in the light rain. 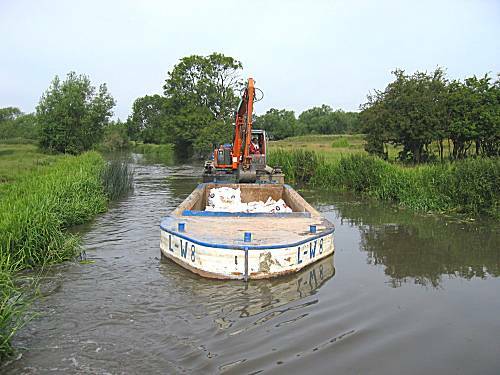 Although this section of the canal was busy, most of the other boats were travelling upward and delays to the crews progress proved to be minimal. 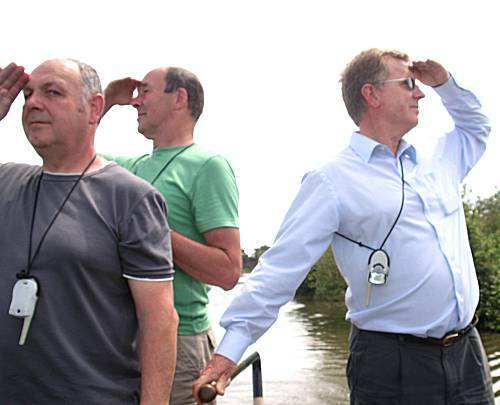 The crew were staggered to observe a large number of Canaltime hired narrowboats, with very incompetent Canadian crews, who clearly had little experience of any navigational skills. Much distress was endured by the competent crew. The crew were intrigued to observe the amazing fish catching skills of a friendly Common Tern, who very closely followed the boat, for at least an hour, successfully diving to catch his prey of small fish. 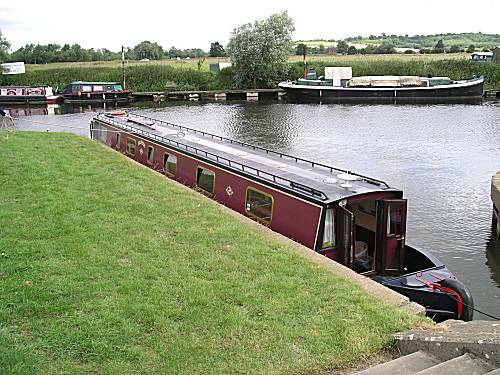 The intended destination for the evening at the village of Branston on the outskirts of Burton-on-Trent was reached at 7-30, where Ron carefully selected an ideal mooring location between a number of other boats. The crew hurried to the Bridge Inn, where after a lengthy wait, enjoyed dinners of Seafood Risotto Marinari and Pizza, served by a competent and very attractive host, Kathleen. They only served Marston Pedigree real ale, which happily proved to be to the liking of the crew who enjoyed a number of pints. Afterwards they returned to the narrowboat to consume very small portions of cheese and biscuits to round off a successful day. The crew, aware that they had achieved their challenging targets for the first day, retired to their beds to consider the tasks for the following day. The crew enjoyed a relaxing comfortable night awakening at the late hour of almost 7-30. Neil prepared hurried porridge and they cast off around 8am to further explore the lower reaches of the Trent & Mersey canal. Concern was raised when the crew realised a problem with the rear loo, which appeared to have a flushing deficiency. Electrical problems were ruled out and as the crew had brought no toolkit, they felt that the matter should be reported to the boat owners. After leaving a message and subsequently speaking with Tony, it was agreed that we would only use the forward loo to save delays which would result from a call-out. After conquering the kitchen stove, Ron prepared an excellent breakfast, which was consumed just before reaching Willington. Favourable comments were made about the quality of the bacon. 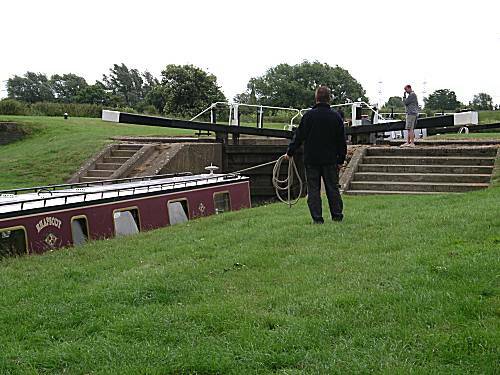 Shortly after Willington, the crew encountered the first of the double width locks. However, these caused the crew no concern, due to their superior skills. As can be seen, considerable effort was required to operate the large paddles of these locks. Due to their excellent boat handling skills, the crew planned to spend their second night at Shardlow and arrived on schedule at 4-30. 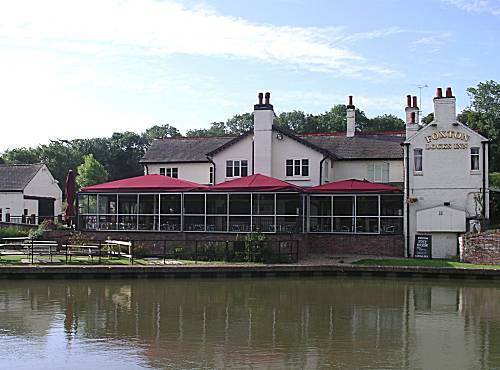 Neil was despatched to enquire as to the best of the several Shardlow pubs. He later returned to recommend that the crew try the Malt Shovel public house and they hurried to investigate the premises. The crew became fed up with Neil complaining bitterly about being bitten alive by the local wildlife. As a result we challenged him to display his wounds to the world. Herewith are the results !!!! Having moored at Shadlow at an early hour the crew felt the need to visit the recommended Malt Shovel establishment. Again the crew found the Marstons Pedigree to their liking and consumed a significant number of pints before returning to the boat for showers and a change of clothing. To their dismay they discovered that no food was served at the Malt Shovel after 6-15 and therefore headed to the Clock Warehouse, where dinners of Gammon, Bangers & Mash and Mixed Grill were purchased. Afterward the crew found the need to take a walk round the local marina before returning to the Malt Shovel for a final pint prior to an early night, without need of cheese and biscuits. The crew remained very nervous about the dangers of leaving the safety of the canal system in the morning and entering the fast flowing and treacherous rivers Trent and Soar, where their safety remains in the hands of their skipper. They left for their bunks in a quiet and solitary mood at the early hour of 10-30pm. The crew (except Alan) complained of a lot of banging during the night and at one stage Ron had to get up to close the rear doors which had been blown open by the strong winds. The crew arose at 7-30 to consume numbing porridge prepared by Neil. 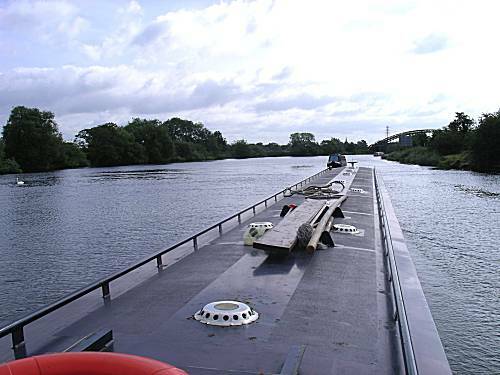 The passage down the last section of the canal was quickly completed before travelling through the Derwent Mouth Lock, where the narrowboat entered the wide and dangerous River Trent. Although very hazardous the crew were able to navigate the boat successfully through the strong currents to the new cut, where they filled with water adjacent to the Sawley Bridge Marina. 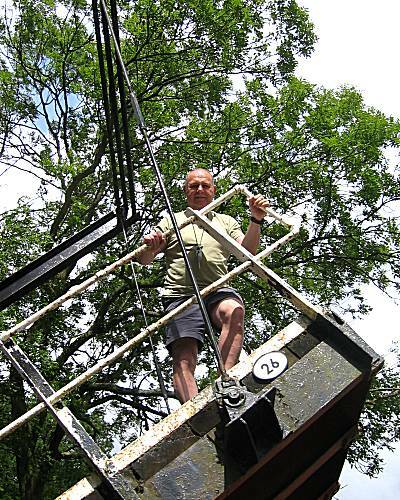 Passing through the giant electrically operated Sawley Lock, operated by Alan, the narrowboat again entered the treacherous waters of the River Trent, where Neil successfully navigated the tight turn into the River Soar, adjacent to a fearfully large weir. After the dangers had passed the crew were able to relax on the pleasant waters of the river and their thoughts again turned to food. 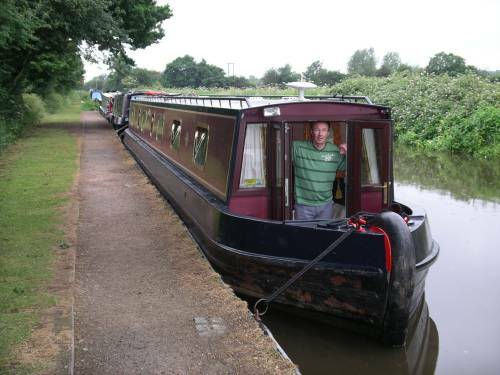 Ron again volunteered to cook breakfast and they moored in the entrance to the Kegworth Shallow lock to enjoy their food, knowing the dangerous tasks for the day had been achieved. 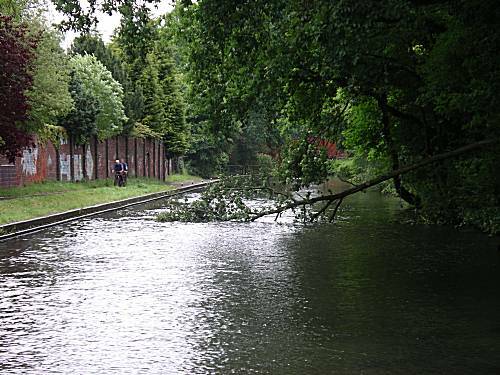 The plan to reach Mountsorrel for the evening now seemed achievable, although the fast flowing waters around Loughborough still had to be navigated. The crew relaxed through the beautiful countryside in the sun watching the planes making their approach to East Midlands Airport, knowing that the Pork Pie remained safely in the fridge. 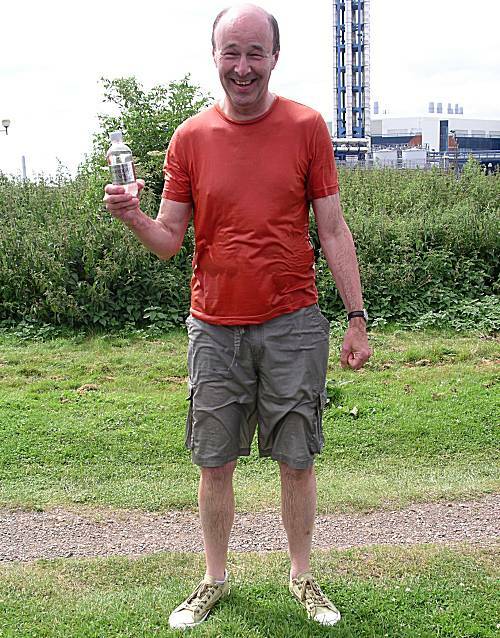 at the Bishop Meadow Lock when a very wet Neil arrived dripping at the front door of the boat. The sure footed member of the crew had taken an unexpected dip in the river !!! With the extra excitement of the day the crew felt need to consume the pork pie, which was enjoyed along with pickles and salad. The narrowboat drew into Mountsorrel, the intended destination, at 6-15pm. Although the crew were at first concerned about the lack of mooring, they quickly located a suitable location close to the Waterside Inn. They felt obliged to test the ales, before dinner, but were disappointed to find the Moorlands Original barrel run dry after just one pint, before reluctantly changing to Everards Tiger Bitter. The crew returned to the boat for quick refreshing showers before rushing back to order their dinners of Gammons and Lasagna before the cut off time of 8-30pm. The meals proved so satisfying that they felt that no further ale was necessary and they returned to their boat for coffee with small portions of cheese and biscuits. 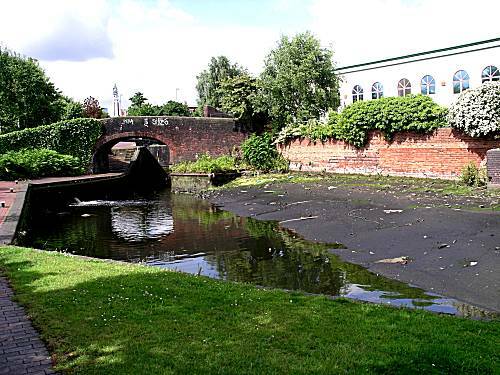 The excited and skilled crew remained apprehensive about travelling through Leicester the following day, which was reported as being full of debris that could jeopardise the safety of the boat. However the crew remained confident that their superior skills would ensure the success of their mission and retired to their bunks after being unable to locate Wimbledon on the television. The relaxed and confident crew sleep soundly until 7-50, when Neil prepared mysterious porridge for the crew. Their tensions were calmed further by a quick magnetic fishing competition, which Neil won, despite Ron using two rods. The scores being Neil - 6, Alan - 4 and Ron - 2. After reaching the centre of Leicester the surroundings improved and the crew took time to visit a Sainburys Local store to obtain more supplies of bread, tomatoes, baked beans and cheese. After the exertions of the day, the crew treated themselves to Magnum ice creams, which were greatly enjoyed. 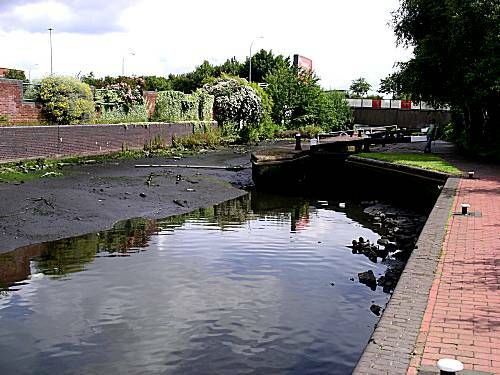 The crew became concerned when the canal considerably narrowed, however their natural instincts enabled the craft to be navigated to safety with great skill. ENGINE PROBLEM - Whilst leaving a lock, the crew were alerted to a problem when the engine overheating alarm sounded. 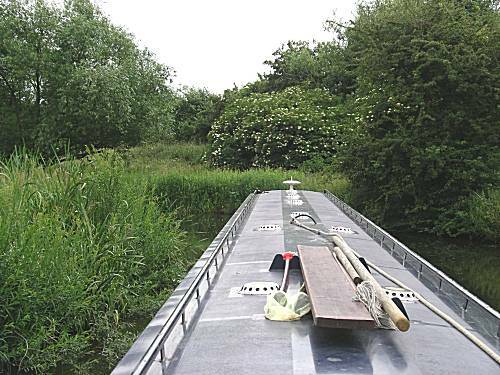 The engine was stopped and the narrowboat drifted helplessly and perilously close to the dangerous reed bank, whilst the skilled crew diagnosed the problem. 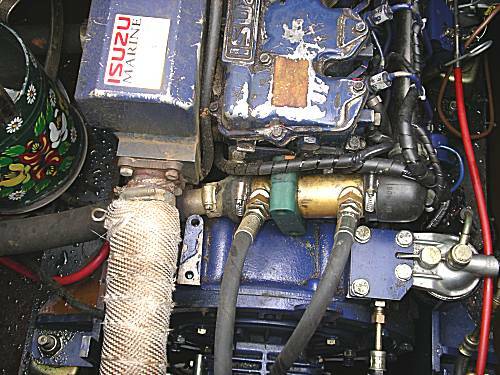 A split hose was soon located and after allowing the engine to cool the radiator cap was removed. Several pints of water had to be added and then it was found that by leaving off the pressure cap, the leakage was negligible. After speaking to the owners the boat was taken gently to Bridge 94 in South Wigston, to await Tony with a replacement hose. The mooring at South Wigston was difficult with an ill defined reed bank, but the experienced crew found no difficulty in securing the boat and deploying a plank to reach the bank. The crew's thoughts again returned to food and a visit was made to the Glen Parva Manor, where several pints of Marstons pedigree were consumed, followed by dinners of Chicken Wensleydale, Chicken Tikka Masala & Fish and Chips were enjoyed. The crew returned to the boat to enjoy cheese and biscuits with complimentary white wine. Tony arrived shortly afterwards and fitted a new hose and thermostat to the engine. After a lengthy testing "Rhapsody" was deemed fixed and Tony was despatched to his home declining the offer of ale. The crew relieved at the outcome, surprisingly felt the need for further refreshment and hurriedly returned to the Glen Parva Manor for further quantities of Marstons Pedigree ale. 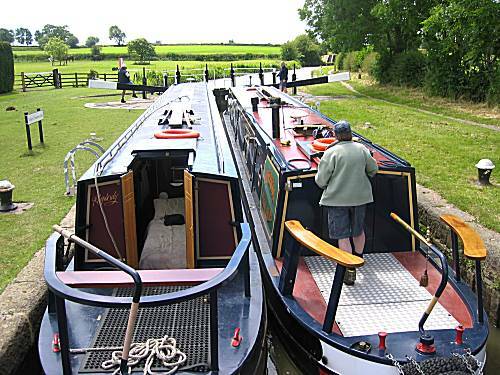 The relaxed crew later returned to the boat to retire to their bunks conscious of the demanding tasks ahead of them necessary to reach their planned destination for tomorrow of the fearful Foxton flight of Locks. The relieved and relaxed crew awoke at an early hour knowing that their narrowboat was in "Tip Top" condition. They quickly devoured Neil's electrifying porridge and cast off before 8am. 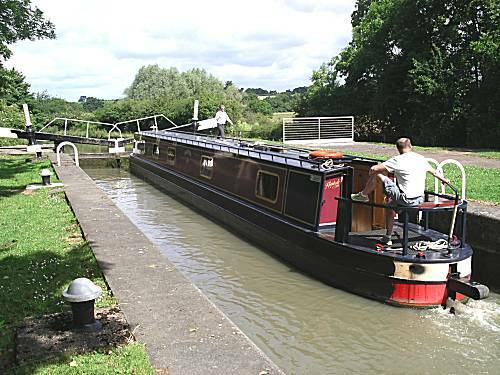 Ron was soon guiding them carefully into Bush Lock on the continuation of their epic journey towards their planned destination that evening of Foxton locks. The crew were aware that the drinking water levels were running dangerously low on board, but had located a possible filling point at Kilby Bridge. After filling with water the crew were faced with a major obstruction of the waterways, but were able to successfully handle the situation. 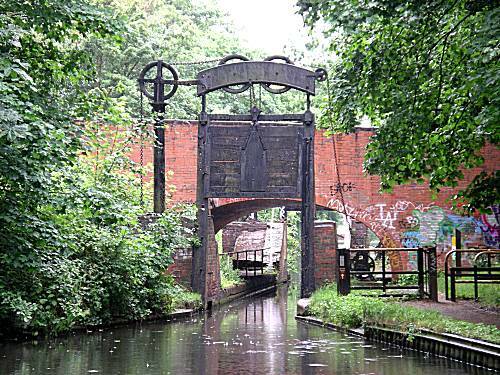 The large number of giant double locks were skilfully operated by the crew as they pressed on through the beautiful Leicestershire countryside. In order to conserve canal water the crew teamed up with another narrowboat to share locks in a very responsible manner. To the amazement of all on board at the second from last lock Ron met his sister and husband coming down the locks on a narrowboat. Ron claimed that he has no knowledge of his sister owning a narrowboat, but the other crew found this unlikely. His sister was able to confirm in person that they would not be attending the forthcoming wedding of Ron's daughter. A total of some 16 giant double locks were accomplished during the morning and the crew were acutely aware that their exertions had been achieved without the benefit of cooked breakfasts. 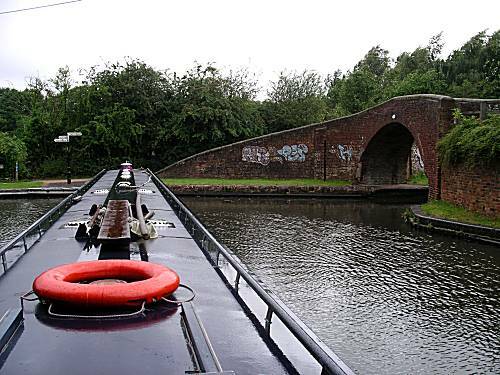 However, on reaching top lock the crews thoughts turned to food and Ron started to grill healthy sausages and soon moored at the first convenient location at Fleckney Bridge. After breakfast and despite their grave concerns, the crew successfully traversed the infamous "Saddington Tunnel" (881 yds), said to be infested with bats. 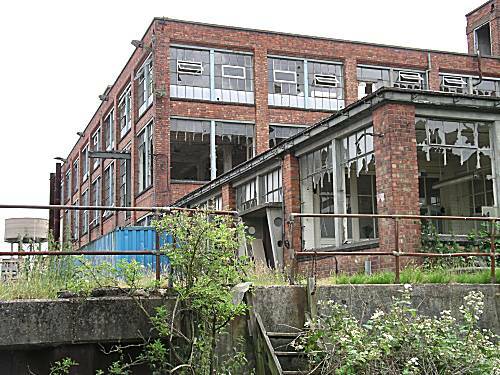 A stop was made at Debdale Wharfe, where the crew visited a boat building establishment to procure a 25 amp fuse. The kind staff, aware of the crucial nature of the crew's expedition, supplied a new fuse, together with a spare, without charge. Due to the crew's excellent progress "Rhapsody" pulled into her moorings, close to the Foxton Locks basin, at the early hour of 4pm. 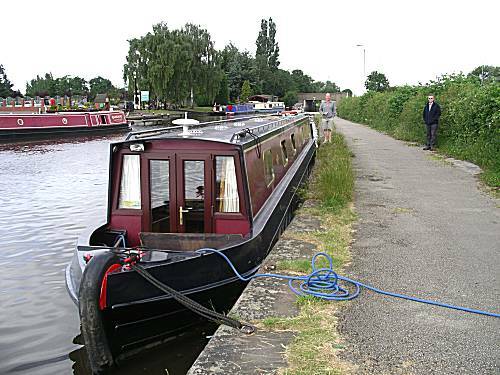 The compassionate crew were quick to assist a narrowboat, with inexperienced crew, that was in difficulty and guided the boat in reverse back to the lock basin where they turned it with the use of ropes and considerable skill. The crew were anxious to investigate the formidable staircase of 10 locks and dispatched Alan to enquire with the lock keeper the arrangements for ascending the flight. He requested an early start and was asked to report at 7-15am. 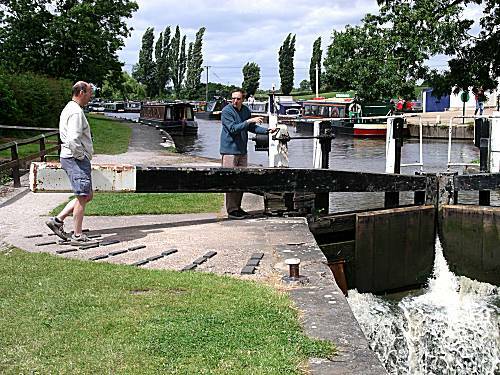 The lock keeper was quick to recognise the superior skills of the crew and they expected a rapid transition of the locks at the start of the following day's expedition, when they planned to reach Crick. Neil selected the Foxton Locks Inn for dinner, where he noted nourishing Fish Pie and vegetables on the menu together with a good selection of real ales. 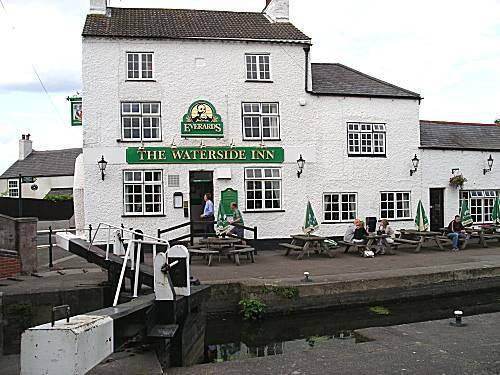 However before booking a table at the Foxton Locks Inn, Alan suggested a walk to Foxton Village a mile or so away to investigate two alternative pubs, but these were not found to suit the crew's needs. After a tour of the historic incline lift site, the crew returned for showers and a change of clothing, before heading to enjoy their dinners of Fish Pies, with red cabbage, carrot and french beans. London Pride was selected as the accompaniment for the dinner until the barrel ran dry, after which Bombardier and Jennings "Tom Fool" was consumed. Before returning to the boat for cheese and biscuits the crew felt the need to visit an alternative premises (Bridge 61) where Adnam's ales were sampled. The tired and exhausted crew retired to the beds, but were unable to settle due to their deep concerns about ascending the feared Foxton Lock staircase in the morning. The anxious crew were up well before 7am to take Rhapsody to the start of the staircase locks and booked their passage with the friendly lock-keeper. However, even at that early hour they found themselves second in the queue for the start of their dangerous ascent. The skilled crew were unperturbed and spent their waiting time preparing portions of stimulating porridge. The ascent of the feared 10 Foxton Locks presented no difficulty for the skilled crew who fell into their well oiled staircase lock routine. The lock-keeper at the top, obviously impressed by the speed and efficiency of the manoeuvres, suggested to the crew that they should make use of the top lock cafe for rations of double egg and sausage breakfasts. Rhapsody was moored and quickly the crew were enjoying their well earned food. 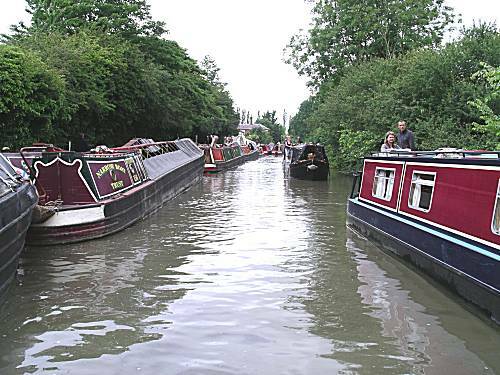 After a look round the museum they returned to the boat to continue onward towards their planned stopping point for the night at Crick, knowing that all the locks for the day had been accomplished, but were aware that yet another obstacle lay ahead of them. 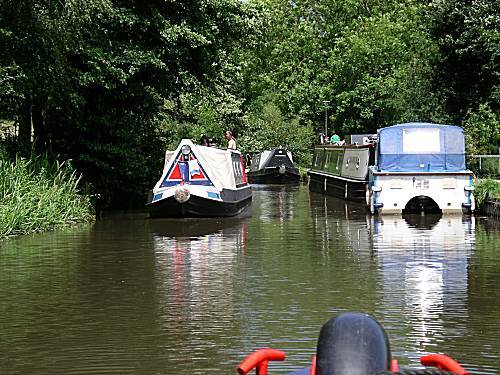 As progress was ahead of schedule, the crew decided to take a diversion down the Welford Arm, where they hoped to collect additional supplies of milk and fresh drinking water. The tight turn was made without difficulty and after 45 minutes and one lock they were at their destination. Whilst Neil supervised the water filling operations and prepared a health lunch of smoked mackerel fillets and salad, the others went in search of a store. They returned with fresh milk and a soft wholemeal multiseeded batch loaf to the great delight of everyone. After lunch the narrowboat was successfully turned in the confined space using rope, barge poles and skilful use of the engine. A four hour journey through the countryside followed, before Rhapsody was carefully guided into her moorings at Crick for the night at 6pm. 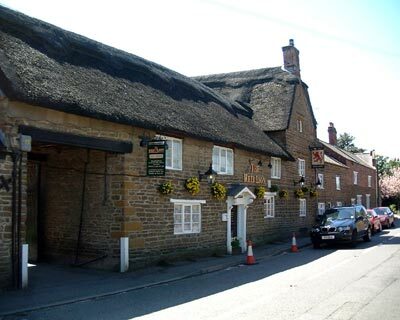 Although Crick boasts 3 pubs, the crew hurried to the Red Lion where their finely tuned instincts detected the best food and ale. They were not disappointed and enjoyed dinners of beef madras, seafood platter and tagine of lamb, with a suitable quantity of Bombardier real ale. Afterwards the crew returned to the boat to discuss their plans for the difficult day ahead. 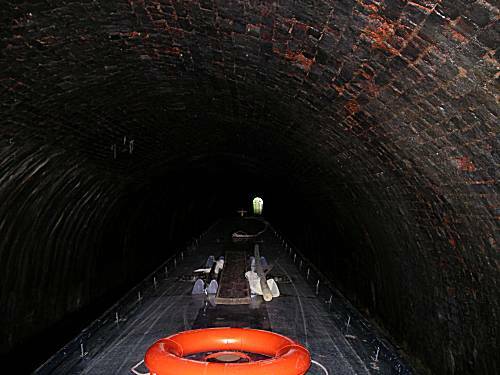 They were acutely aware that two tunnels (The longest yet), together with the dreaded Watford staircase locks lay ahead of them and this together with the extra stress of having to negotiate the additional narrowboat traffic at Braunston for the weekend festival, would put unbearable pressure on them. The thought of these daunting tasks made their minds turn to food and portions of cheese and biscuits were taken to calm their nerves. 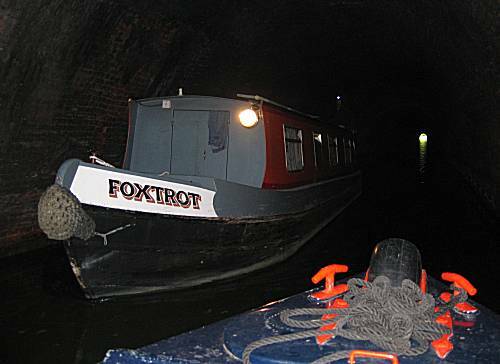 The crew were up before 7am and left their moorings at 7-20 after fulfilling porridge, shortly to enter the long, dark and dangerous Crick Tunnel (1529 yds). After a successful transition of the tunnel they shortly passed under the M1 motorway before arriving at the Watford staircase lock system. 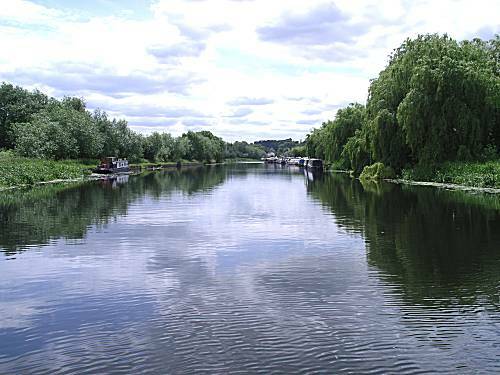 After reporting to the lock keeperess, with bicycle, they awaited between locks 1 & 2 for two other boats to pass upwards, before the crew skilfully and swiftly navigated the locks. 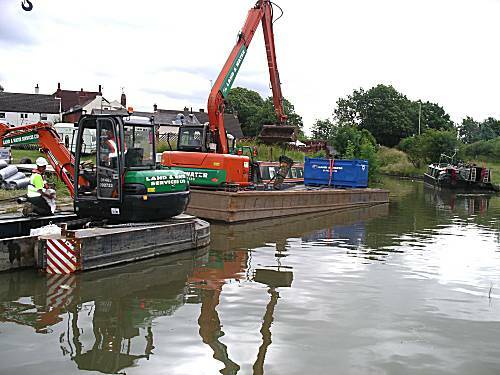 Although progress was good passing boaters warned of life shattering delays at Braunston during the build up to the weekend festival. 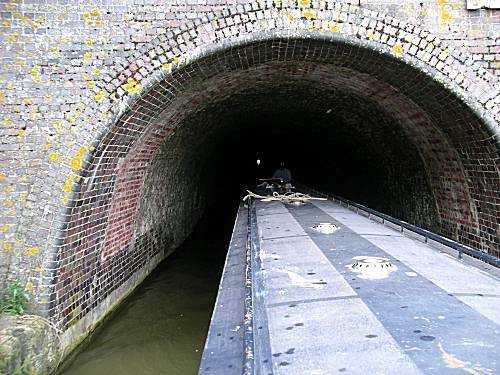 Despite another narrowboat travelling at high speed on the Grand Union main line, Neil managed the incredibly tight turn at Norton Junction and the crew realised that they would soon be at the second tunnel of the day. 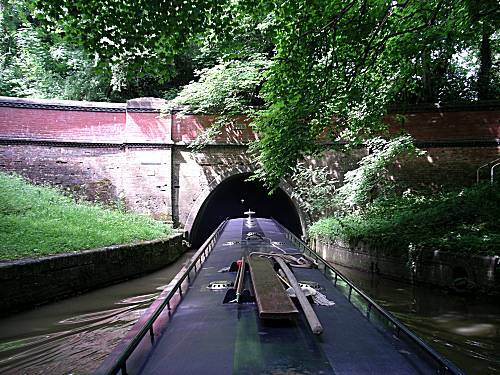 The far from straight Braunston tunnel at 2042 yards was the longest yet of the adventure and the crew were aware that the high level of fumes that are trapped in the depths, would cause life threatening problems. To make matters even worse not only one, but two boats were met travelling in the opposite direction. With Neil's advanced steering capabilities calamity was avoided. Some sort of old barge event was happening at Braunston which did lead to every old barge in Christendom converging on Braunston for the weekend. It was rather a squeeze to get through for normal mortals, but not of course the resourceful crew, who barged through, as one does on a barge. Braunston Junction was not the greatest moment for the crew. A slight communication lapse meant that Neil tried to turn right instead of left. With an adverse wind and a late decision some inelegant to'ing and fro'ing was necessary, much to the amusement of the owner of a wooden barge parked on the junction. The crew then met a barge coming in the opposite direction who indicated they wanted to turn right. However, it transpired that too much was read into the signal as he was merely pointing out Braunston to a friend and they in fact wanted to go left. Words of advice were exchanged. Life calmed down for the crew after Braunston and their attention again turned to food. A stop was made for a cooked breakfast before Napton Junction. After the junction, which was skilfully negotiated by Alan, only the Stockton flight of 10 double locks lay between the crew and their intended stopping point for the evening at Long Itchington. At the top of the three Calcut locks the crew stopped briefly to consume freshly prepared asparagus tips with ham and hot dogs. The unusual combination was greatly appreciated and provided additional energy to the tackle to forthcoming locks. 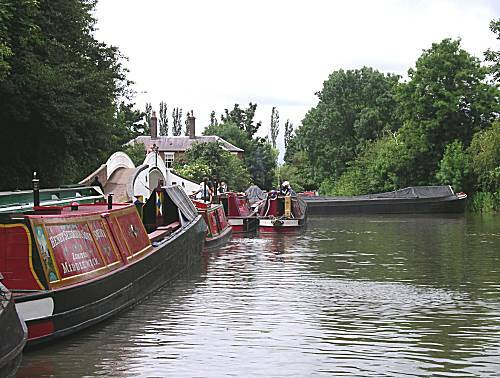 On arrival at Long Itchington, completely on schedule, the boat was moored on an exposed aqueduct location only a few hundred yards from their chosen eating place for the evening, the Two Boats. Dinners of Scampi and 8 oz rump steaks (medium) were chosen by the hungry crew, together with a number of pints of Adnams Broadside ale. After dinner Alan and Neil decided on a walk to investigate the village of Long Itchington, which they considered to be very pretty and well to do area. They felt compelled to visit the "Duck on the Pond" public house and try a pint of their Charles Wells Bombardier ale, served by an attractive Slovakian waitress. Afterwards they returned to the boat satisfied that their narrowboating expedition remained on-plan. The crew awoke at 7-20 am to a fine morning and Neil prepared energising porridge to sustain the crew for a long and arduous day with some 31 giant Grand Union locks to tackle. Ron left at the crack of dawn in search of bacon and sausages and came back armed with a range of delights to the amazement of the other members of the crew. After leaving, the first locks very quickly came into the sight of the crew. 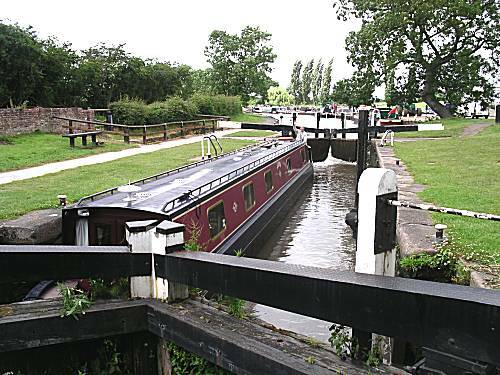 It was double staircase without any sign of a lock-keeper to ensure safe passage, however, the crew were un-daunted by this fact and swiftly operated the lock system in a speedy and professional manner, much to relief of the other canal users. After this the locks that followed were of the now normal double size. 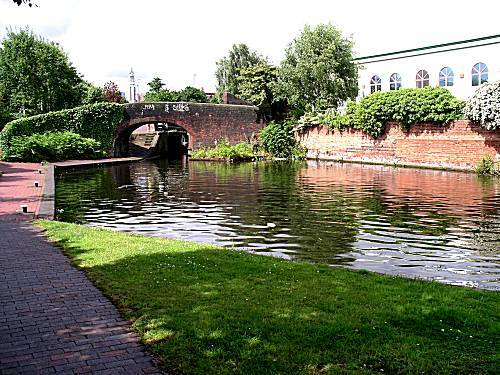 Following Lock 23 the canal wound its way through Leamington Spa and Warwick and after the exertions of the morning the crew moored to enjoy a delicious cooked breakfast prepared by Ron. However, the crew were only too conscious that a further 21 locks had to be negotiated before the end of the day. The first two Warwick (Cape) locks presented no problems until the crew caught sight of the formidable Hatton flight. The crew set about the ascent with their normal fortitude. About half of the locks were empty which reduced the load somewhat. However, operating the paddles was still very draining with 22.5 turns to fully open or close each one and having to climb continuously out of the boat to hold the barge against the current was equally draining. 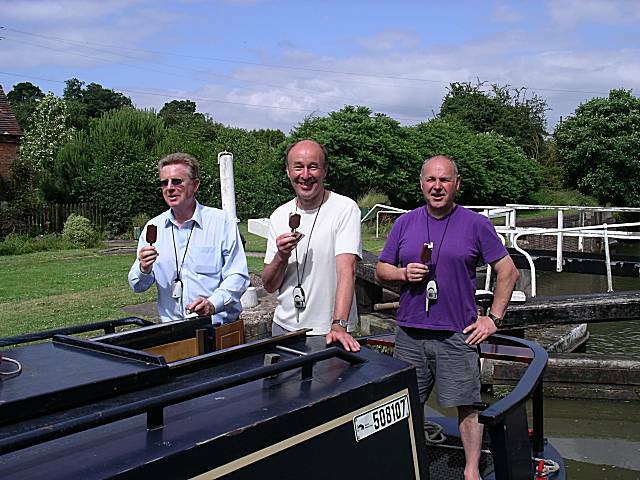 The crew felt need to celebrate the successful ascent of the Hatton Locks, by treating themselves to Magnum ice-creams, which greatly lifted their spirits. The obvious relief that the crew showed after the success of their extreme exertions made their thoughts again return to food and Neil quickly prepared ham sandwiches with salad, including pickled onions, which were consumed on the move to their final stopping point for the evening at Kingswood Junction. A stop was made a mile short of Kingswood at Turners Green, but the location was deemed too close to the M40 motorway for a good night's sleep and also the pub was closed!! The crew then walked the last mile to Kingswood and selected a suitable mooring location. The Navigation Inn was visited, where a table was booked and their Adnams Broadside Ale tested, which proved entirely to their satisfaction. After returning to the boat it was quickly repositioned to Kingswood and after showers they headed back to the Navigation for dinners of Gammon, Chicken, Leek and Stilton Casserole, and Smoked Haddock, with mashed potatoes. After a second pint of Adnams the crew changed to further pints of Timothy Taylors Landord ale. 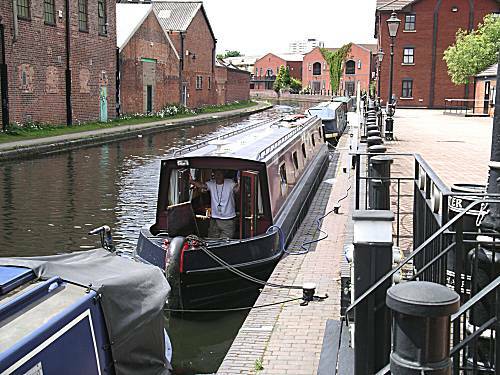 The details of their planned journey into the heart of Birmingham on Sunday were discussed, back at the boat, while they finished off the bulk of their cheese and biscuits supplies. The journey would entail a torturous 17 miles, the 20 Lapworth locks and 9.5 hours of cruising. 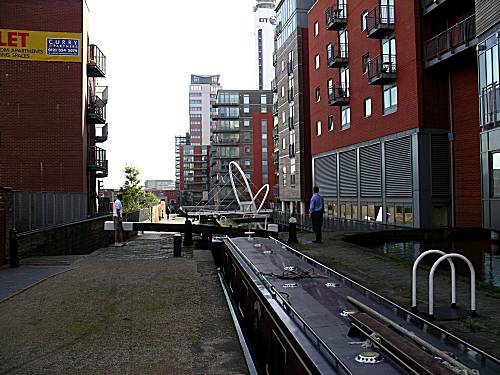 The crew, although nervous, were aware that the Birmingham visit was achievable and greatly looked forward to the possibility of a Chinese Dinner at Gas Street Basin. Although Rhapsody had been moored close to a railway bridge, the tired and exhausted crew were confident of a good night's sleep and they retired to their bunks, after a little Wimbledon, to contemplate the successes of the day. The crew awoke at 7am to devise their plans for the ascent of the Long Laborious Lapworth Locks. They decided a surprise dawn attack before the locals awoke. After extra portions of pleasing porridge they set off, maintaining radio silence and with the engine in quiet mode they stealthily attacked the first 15 locks. At the following lock, however their luck changed when three local narrowboats, with inexperienced crew, set off greatly slowing their progress. However, with skill and determination, top lock was reached in an amazing 2 hours and 20 minutes. The crew scoured the maps to locate a farm shop, which had been visited on a previous adventure, where they hoped to top up their supplies of on-board provisions. They fondly remembered the excellent Pork Pie that was purchased previously and felt that after the successes of the Lapworth Locks, they deserved special treats. In an organised way Ron, knowing the shop to be located near Bridge 20, advised that breakfast preparations would be started at precisely Bridge 24. Great disappointment assailed the crew, when after finishing their superb breakfast and hurrying towards the farm shop they found it closed !!! The realisation struck them of yet another lunch without pork pie. On-board stocks of drinking water and provisions were running dangerously low as the crew approached Birmingham. The mission was becoming a race against the clock, for fear that Sainsbury's may be closed. Rhapsody pulled into its moorings at Gas Street basin, Birmingham just after 5pm. After filling with water the crew hurried to a local Tesco Express and purchased essential provisions including, Porridge, Bread, Milk & Coffee. However, they were disappointed to note that there was no stock of Pork Pies. Despondent they made their way to the Malt House, where they were looking forward to several pints of Courage Directors on the Balcony overlooking the canal. To their horror they discovered that no real ales of any variety were available. 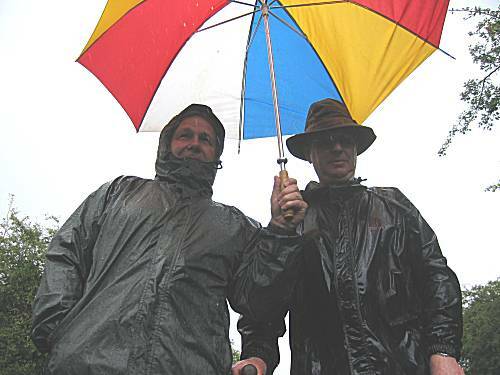 They therefore left to return to their boat without Pork Pie or Ale !!!! Following a recommendation, the crew looked in vain for the Prince of Wales public house, who were alleged to stock a good selection of real ales. After some research on Google, the pub was located an a number of pints of Timothy Taylors and Broadside were sampled, before heading for the now traditional Chinese at the Tin Tin restaurant in Brindley Place. Banquet dinners, with crispy duck, were enjoyed, followed by some more ale at the Prince of Wales. The crew returned to their boat, but were unable to consider either cheese or biscuits and retired to their bunks to ponder whether they would ever to find the elusive Pork Pie. Despite revellers returning to their homes at 4am, the crew slept soundly until 7-20am. New Tescos (smooth) porridge was prepared while the crew made preparations for the major descent of locks through the heart of Birmingham centre. 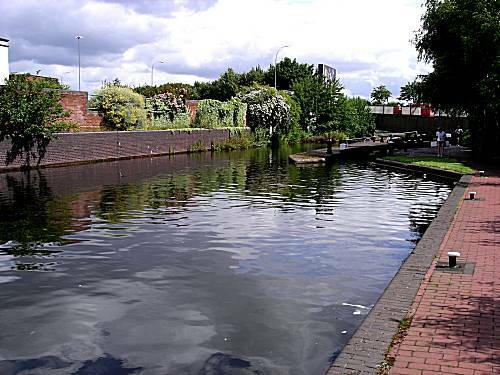 MAJOR LOCK PROBLEM - Whilst taking a short break before the start of the Aston Flight of locks, the crew were approached, on foot, by a person from the boat ahead, who was greatly distressed. It transpired that the pound between locks 1 & 2 was nearly empty and totally impassable. The experienced crew finished their coffee and went to investigate the problem. 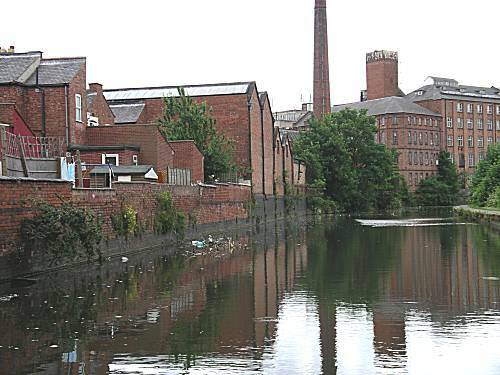 The distressed boat owner had already reported the matter to British Waterways and was awaiting a call-back. The intrepid and skilled crew, using their advanced analytical skills quickly diagnosed the problem and set about remedial action. Both paddles on Lock 1 were opened fully and very quickly the pound level started to rise. 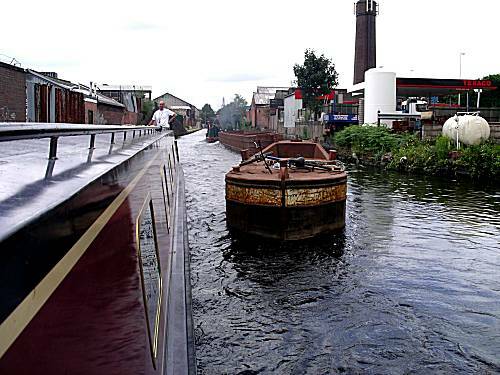 Within 30 minutes the lock pound was returned to normal and both narrowboats were able to passed successfully down the flight. After breakfast, Neil took a walk in search of a Pork Pie shop, but failed in his mission to locate one. In desperation he even called at a local cafe, who were also out of stock. The severe shortage of Pork Pies in the area, caused the crew much distress and they resigned themselves to yet another day without one. Later in the afternoon after making good progress down the Birmingham and Fazeley canal, the engine overheating warning again sounded. After a number of attempts at limping onwards the owners were called and the emergency services scrambled. The crew had diagnosed failure of the same hose that had been replaced earlier in the adventure. Trevor and colleague from the "Rivers & Canals Rescue" service arrived at 7-05pm and set about the task of repairing the Rhapsody overheating engine. They quickly replaced the faulty hose and set about the difficult job of purging the cooling system of air. After completion and pressurising the system, yet another leaking hose was found, which also had to be replaced. The competent engineers left at 8-30pm declaring the engine fixed and the crew then hurried to the White Horse in Curdworth for belated dinners of Fish Pie, Curry and Gammon. To the delight of the crew Alan negotiated a special half price deal on the Everards Tiger Bitter, the taste of which proved slightly better than the crew had expected. After the excitement of the day the crew felt need for cheese and biscuits on board their boat, before retiring to their bunks relieved that all was well in the engine department. However, they were critically aware that they has seriously fallen behind their targets and getting Rhapsody back to its moorings in Lichfield for Tuesday night was far from certain. A very early start would be required. The crew awoke early and after large helpings of perfect porridge cast off at 7-45am on their mission to make up the lost time and attempt to return Rhapsody to its home base at The Kings Bromley Marina near Lichfield. 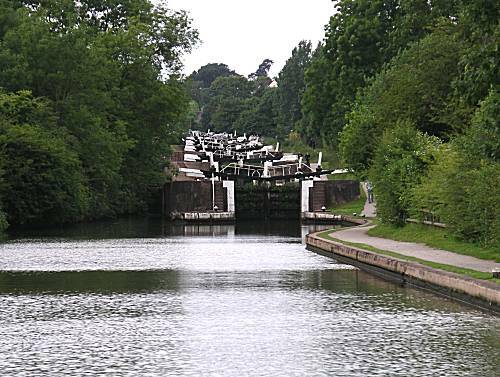 The Curdworth flight of 11 locks lay before them and although started well, a number of other craft were seen to delay the progress of Rhapsody. 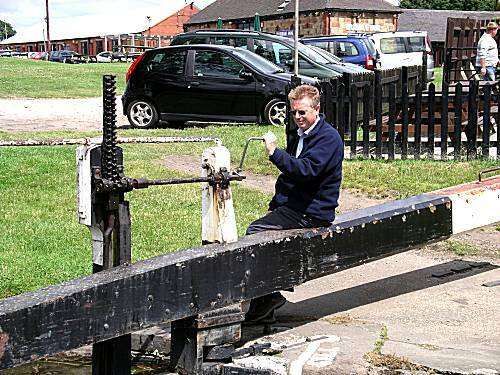 However, with great skill the locks were past and the crew settled down for the long cruise to Fazeley Junction. As considerable energy would be needed for the difficult tasks ahead of the crew, Ron took the opportunity to start breakfast shortly after 10am, so that there would be time to fit in a nourishing lunch. In anticipation of the hard work ahead, the crew awarded themselves additional breakfast rations, with 1 1/3 sausages, 1 1/3 bacon rashers and an extra slice of toast, much to their delight. 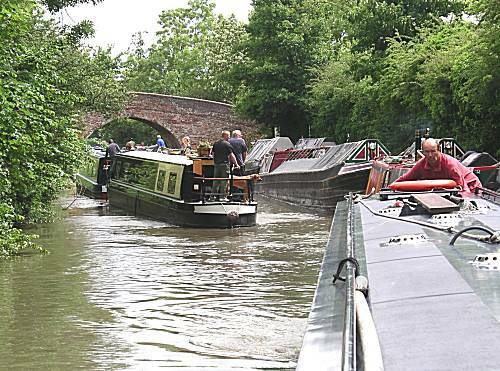 The journey to Fradley Junction at the top of the Coventry Canal proved the busiest section of the whole adventure with a constant stream of passing boats, testing the crews skills, however this did not detract them from the difficult task in hand of getting Rhapsody back to its home base. Telephone contact was made with the owners and provisional meeting point and time agreed. 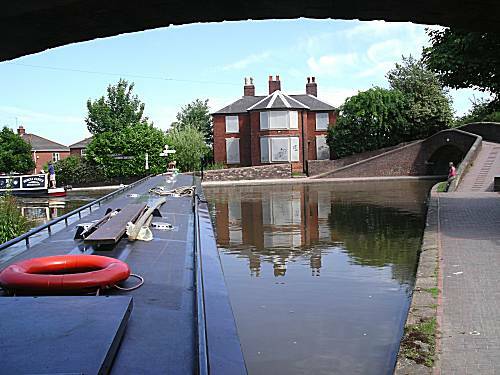 Fradley Junction was reached in good time and the crew knew that completion of their adventure was within their gasp. However, they had to remember that three more locks awaited them after the junction and success could not be guaranteed. 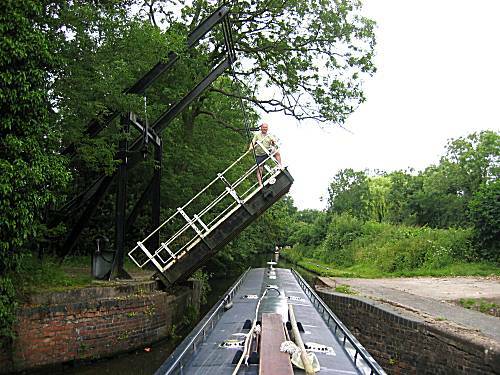 The difficult turn at Fradley Junction was executed with great precision, but delays occurred at the last locks due to a significant number of poorly crewed narrowboats. Rhapsody pulled into her final moorings and awaited the arrival of the owner. The jubilant crew congratulated themselves on another successful adventure which had brought more testing and fearful incidents than any previous trip. However, they were only too aware that the bulk of the voyage had been completed without the benefit of Pork Pie, but vowed to continue the search for supplies on their next adventure starting the first week in September.